Few spiders are completely confined to houses, the daddy-long-legs spider Pholcus phalangoides being an exception (see Unusual House Spider). However, garages, outhouses and sheds are the preferred habitat of a number of species, and some of these do invade houses, often in the autumn, where they sometimes trap themselves in baths and wash-hand basins. Principal amongst these synanthropic species is a mesh-webbed spider Amaurobius similis, an example of which Gwen recently found in her garage window-frame at Torbreck (NC0824). It is about 10mm long and the abdomen bears a dark-brown wedge-shaped marking edged in yellow. Its lace-like web is sticky when fresh and has a circular retreat into a crevice. It is said to be a fearless predator on any living creature unlucky enough to wander onto its web. 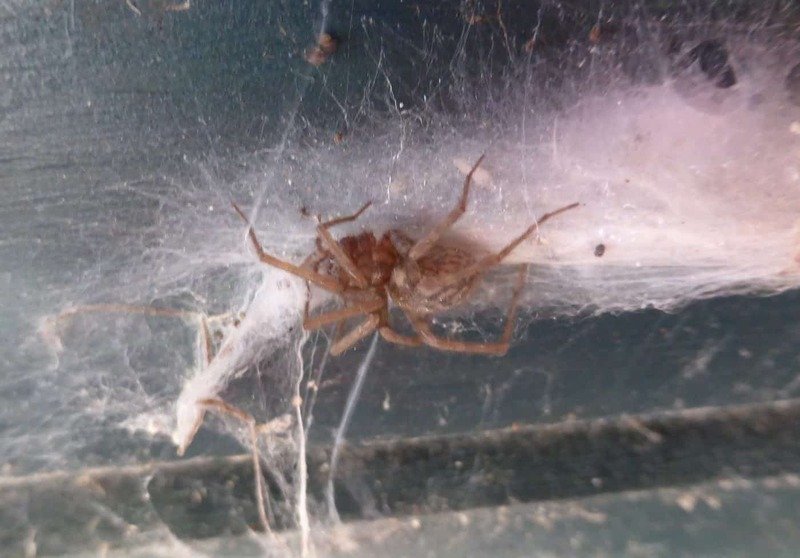 It ‘probably occurs in almost very house and outhouse in the country’, but records from Highland Scotland are few, reflecting more the scarcity of arachnologists than spiders. 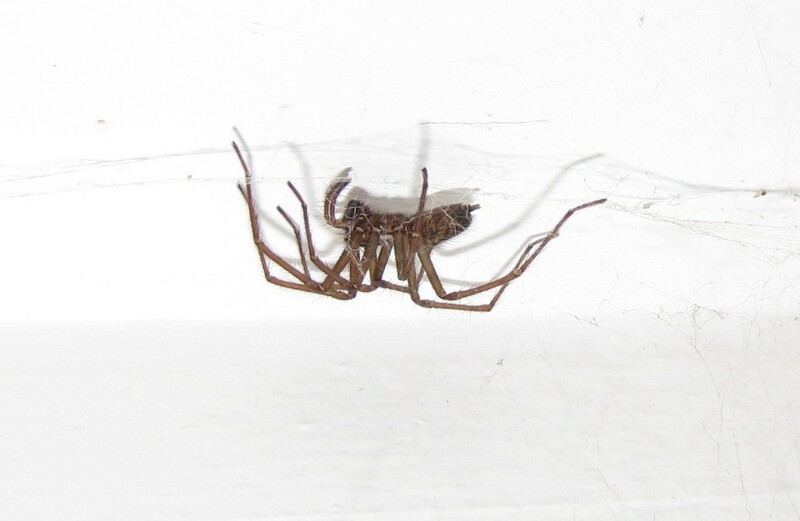 Also frequently encountered in houses, mainly as invaders rather than residents, are two species of the genus Tegenaria, spiders with long hairy legs that construct sheet webs. Both of our garages, at Torbreck and Nedd (NC1331), display numerous substantial cobwebs woven by the common house spider Tegenaria domestica. It has a body about 10mm long, medium-length legs spanning about 20mm, and an abdomen with a pattern of pale chevrons. It is adult throughout the year, widespread in the British Isles but only sparingly recorded in Highland Scotland. Much bigger, with a body up to 16mm long and a leg-span of over 50mm, is the large house spider Tegenaria gigantea, a female example of which appeared in the utility room of my house at Nedd on 14th February 2018. 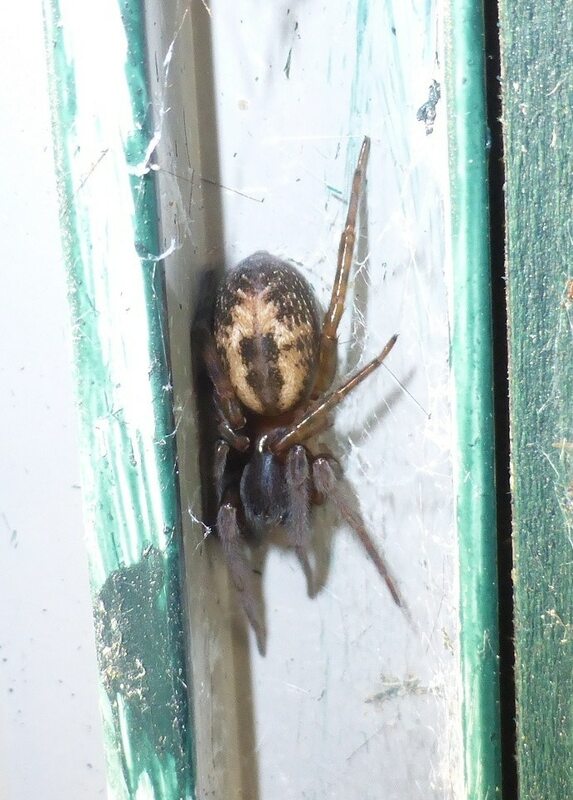 This is the archetypal ‘hairy house spider’, which is, again, only occasionally recorded in Highland Scotland. It builds a very large sheet web with a tubular retreat, and although it ‘cannot deliver a painful bite’, its ‘unpopularity arises from the leg span, rapid movements [ten times faster than a human sprinter, size for size] and general creepyness’ and that is the opinion of a dedicated arachnologist!